By completing the form on line you are agreeing to the Terms and Conditions. Please supply 3 images of your work. Format - jpeg at 300 dpi (600 x 600 pixels) no bigger than 1.2mg. Bridget will send you an acknowledgement of your application. Each studio group will be expected to work together and with neighbouring studios to maximise publicity and co-ordinate signage. Studio management will be the responsibility of each Studio group, but advice and support will be available if needed. Studios must be open from 10.00 - 5.00, and there should be someone in attendance during this time. You are responsible for the security of your own work at all times and you may wish to take out your own insurance. Safe access is a must and the safety of your visitors will be your responsibility. Work to be exhibited may be of any type and in any media but it must be appropriate for a community event. You are asked to consider quality of work when selecting pieces for display in your Studio. A wide variety of work is encouraged to add to the interest of the occasion, and should be professionally presented. 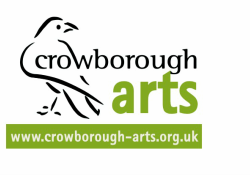 © Copyright Crowborough Arts 2018.